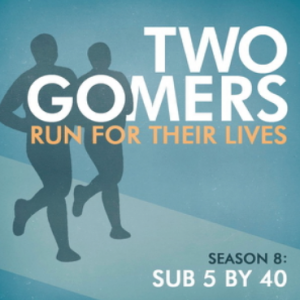 It’s the third, and final, Two Gomers Special: Two Gomers Get Ready! The guys are pulling out all the stops to prepare themselves for the (fast) approaching Marathon, including harkening back to the tiny vestiges of running experience both had as young lads. And seriously, we’re talking tiny vestiges here. But it’s enough to guide them through a packed Special that takes them through a journey from Ready, to Set, to GOOOOOOOO(mer). Join them as they talk through the fears, hopes, plans, doubts, questions, and reflections concerning the Minneapolis Marathon, now only four weeks away! We’ll be in the back. So download while the downloadin’s good! Click the first button to donate. Suggested donation: $2.99, but if you want to dig deep and do a by-mile donation ($26.20 or $13.10), you’d be a hero to the Gomers forever. Then click the second button to download the special (right click on the DOWNLOAD button and select “Save target as…” or “Download Linked File”). If you donate and include your email, your name will be entered into a drawing for one of ten FastDraw water bottles from Ultimate Direction ($18 value!). Thanks in advance! Happy Running! Donated (not much but … ) and downloaded but it will only play half the episode (to about 38mins) … two more attempts have resulted in same. My system or problem with the podcast??? I was wondering–I downloaded Two Gomers Get Ready but can I listen to it on my ipod? Hi…I was able to listen to the special on my iPod by first saving it to my desktop. I could then drag the shortcut from the desktop to any playlist in iTunes, sync my iPod, and enjoy the show. Hope this helps. I guarantee the whole gomernation is excited that your marathon is so near. You two can do this. Be excited and take it as it comes. You have inspired, entertained and educated so many people already so you have won your place in any marathon. Just have fun. I also saw that ad in Runner’s World and it gave me pause. I had to question whether I should try to run a Marathon or not. But that thought only lasted a short while. There are a whole lot more of us than there are of them. Surely the race directors love us. Now go run one for the Gomers!! Thanks Laura … your tip and the help of my 13yr old son got me the whole episode. Great episode Gomers! Guys, the last two special episodes don’t download anymore!